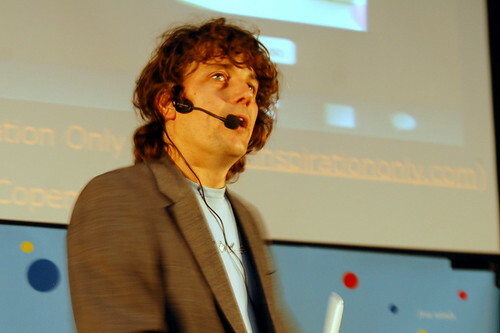 On Thursday and Friday, June 25 and 26, 2008, Ianus Keller returned to Copenhagen to attend and talk at the reboot10 conference with this year’s theme free. After ReBoot8.0 I felt on one hand inspired by the talks, the mood and the participants, yet on the other hand completely out of touch with the crowd of bloggers, thinkers and writers. The audience and speakers didn’t seem to connect with the physicality and realness of products and prototypes; the world of bits and atoms. This is why I wanted to educate the audience at reboot10 by doing a talk about the relationship between hardware, software and services and the value of having a physical object in the hands of people. After all the excuses above, there’s no turning back now. I embedded the video of my talk so you can judge for yourself. It really is a presentation of half-formed thoughts, using a tool for half-formed thoughts. I’d love to improve on it in a later presentatio, but enjoyed every (uncomfortable) minute on the stage and the instant feedback. Slides (with links) are also embedded below, which I may turn out in a SlideCast if I ever want to take this talk any further. Luckily I was able to completely enjoy and indulge myself after the presentation. I found out that quite some topics and workshops were targeted at bridging the gap between bits and atoms lively micropresentations session gave me a chance to revisit the Tools For Inspiration presentation I did in 2005. The talks, mood and participants were still inspiring, so I leave you with my set of photos from reboot10.